Buckaroo Banzai Ep. 23: So What? Big Deal. Our final episode features two Blue Blaze Irregulars from the World Watch One Newsletter, Dan Berger and Steve Mattsson. We cover Minutes 100 to the film’s end, including mysterious lettering, the legendary Banzai Credits March, and a few surprises. This entry was posted in Episodes and tagged banzai march, big deal, billy travers, black lectroids, buckaroo banzai, casper lindley, credits, dan berger, end, john parker, kolodny brothers, new jersey, penny priddy, perfect tommy, pinky carruthers, rawhide, reno, rugsuckers, scooter lindley, sequel, so what, steve mattsson. This entry was posted in Episodes and tagged michael boddicker, music. We near the end of our adventures in Minutes 95-100, which cover the demise of the Panther Ship, Buckaroo’s blue-screen parachute fall, Scooter’s rewards, and Buckaroo’s last kiss with Penny Priddy. Featuring Steve Lastoe from the X-Minutes podcast. This entry was posted in Episodes and tagged black lectroids, buckaroo banzai, dr lizardo, john o'connor, john parker, john whorfin, new jersey, panther ship, penny priddy, perfect tommy, reno, scooter lindley, secretary of defense, thermopod, world watch one, yoyodyne. Derek M. Koch from Monster Kid Radio joins Brett and Josh for Minutes 90-95, covering Whorfin’s attempt to breach the 8th Dimension, the fate of John Bigboote, fluids on ships, and Buckaroo / John Parker’s adventure on a portrait-laden Thermopod. This entry was posted in Episodes and tagged buckaroo banzai, dr lizardo, john bigboote, john o'connor, john parker, john whorfin, panther ship, reno, scooter lindley, secretary of defense, thermopod, yoyodyne. Special guest and Buckaroo Banzai fan Greg Wyshynski from ESPN joins Brett and Josh to discuss Minutes 85-90, covering the Battle of Yoyodyne, creepy slime gerbils, lots of shootin’, and lectroids falling from tall girders. Sponsored by Thermopod! This entry was posted in Episodes and tagged buckaroo banzai, dr lizardo, john bigboote, john o'connor, john parker, john whorfin, monkeyboy, new jersey, panther ship, penny priddy, perfect tommy, reno, rugsuckers, secretary of defense, thermopod, yoyodyne. For Minutes 80-85, Josh and Brett are once again joined by Figmentfly.com’s Sean Murphy to discuss the prelude to the Battle of Yoyodyne. We cover hapless guards, bivouacs, colorful mobiles, soft lectroids, and soothing PA announcements. Believe it! This entry was posted in Episodes and tagged buckaroo banzai, bus, casper lindley, dr lizardo, john bigboote, john parker, john small berries, john whorfin, john ya ya, kolodny brothers, new jersey, perfect tommy, reno, rugsuckers, scooter lindley, secretary of defense, world watch one, yoyodyne. Groundhog Minute’s Sean German joins Brett and Josh to discuss Minutes 75-80 of Buckaroo Banzai. Topics include junk food and batteries, cookies, megalomaniacal speeches, Rug Suckers vs. Kolodny Brothers, proper grammar, and the Try Wing Fighter. This entry was posted in Episodes and tagged buckaroo banzai, bus, casper lindley, dr lizardo, jetcar, john bigboote, john parker, john whorfin, kolodny brothers, new jersey, penny priddy, perfect tommy, reno, rugsuckers, scooter lindley, secretary of defense, world watch one, yoyodyne. In this week’s episode of 5 Minutes of Bonsai, S.E. Angerman-san experiments with species of ficus. Will it reveal a sleeping cat, or a charging dragon? Featuring special guests Brett and Josh. This entry was posted in Episodes and tagged bonsai, ficus, s.e. angerman. Gerry Porter and Pete Mummert from the Indiana Jones Minute join Josh and Brett to discuss Minutes 70-75. Featuring the unofficial words to the Banzai March, more President Toht, a panicking General Catburd, and the Declaration of War: the Short Form. This entry was posted in Episodes and tagged buckaroo banzai, bus, casper lindley, dr lizardo, general catburd, john parker, new jersey, perfect tommy, president widmark, prof hikita, reno, scooter lindley, secretary of defense, senator cunningham, smirnoff, world watch one, yoyodyne. Tom Taylor from the Indiana Jones Minute joins Brett and Josh in discussing Minutes 65-70, which feature Ronald Lacy as the President, Yakov Smirnoff, more Jeff Goldblum, Screaming Yellow Zonkers, and honey. With bonus commentary by Lena Horowitz. This entry was posted in Episodes and tagged billy travers, buckaroo banzai, bus, casper lindley, dr lizardo, john bigboote, john o'connor, john parker, new jersey, penny priddy, perfect tommy, president widmark, prof hikita, rawhide, red glasses, reno, scooter lindley, secretary of defense, smirnoff, world watch one, yoyodyne. This week we discuss Minutes 60-65 with Hong Kong / Denver Cavaliers Neil Brown and George Hendricks from the Mogwai Minute. The minutes cover skungy spider-ticks, flaming file cabinets, more Goldblum-ometer readings, and of course, the watermelon. This entry was posted in Episodes and tagged banzai institute, buckaroo banzai, casper lindley, john bigboote, john o'connor, john parker, new jersey, penny priddy, perfect tommy, pinky carruthers, prof hikita, rawhide, red lectroids, reno, scooter lindley, watermelon. Special guest Asterios Kokkinos gives his spirited take on BB as we discuss Minutes 55-60, which includes the return of the Goldblum-ometer, the Perfect Tommy Wardrobe Recap, a “hologram” John Emdall, bubble-wrap masks, and a doomed lab assistant. This entry was posted in Episodes and tagged asterios kokkinos, billy travers, black lectroids, buckaroo banzai, bunkhouse, casper lindley, john bigboote, john emdall, mrs. johnson, new jersey, penny priddy, perfect tommy, pinky carruthers, prof hikita, rawhide, red lectroids, reno, scooter lindley. Brett and Josh discuss Minutes 50-55 of Buckaroo Banzai with Jim O’Kane from the Airport and Rocketeer Minutes. Topics include the many Johns of Yoyodyne, the Black Lectroid John Parker, 300 Baud Modems, Orson Welles, and a can of Michelob. This entry was posted in Episodes and tagged billy travers, black lectroids, buckaroo banzai, bunkhouse, john bigboote, john gomez, john o'connor, john parker, john small berries, michelob, mrs. johnson, new jersey, perfect tommy, pinky carruthers, rawhide, red lectroids, reno, van, war of the worlds, yoyodyne. For Minutes 45-50, Josh and Brett are joined by MxM podcasters Jonathan Carlisle and David Johnson. Discussions cover Blue Blaze Irregulars Scooter and Casper Lindley, bright colored sofa sales, Gear-Up, black lectroids, and the CompuPro System 8/16. This entry was posted in Episodes and tagged billy travers, black lectroids, blue lightning, bubba, buckaroo banzai, bunkhouse, burt, harley, john bigboote, john gant, john gomez, john o'connor, john parker, motorcycle, mrs. johnson, new jersey, new jersey state trooper, penny priddy, perfect tommy, prof hikita, rawhide, red lectroids, thermopod, van, yoyodyne. Brett and Josh discuss Minutes 40-45 with Bunkhouse member Curtis Bloes of the Better Off Dead Minute. These minutes follow the adventures of the hunters Bubba and Bert, the Fall of John Valuk, Red Lectroids, and Perfect Tommy’s radio call for help. This entry was posted in Episodes and tagged black lectroids, bubba, buckaroo banzai, burt, harley, john bigboote, john gomez, john o'connor, john parker, john valuk, motorcycle, new jersey state trooper, perfect tommy, prof hikita, rawhide, red lectroids, thermopod, van. For Minutes 35-40, Justin Coote from the OverlookHour podcast joins Brett and Josh in discussing phone booths, Elephant Bravo clearance, 1980s blue lightning, comic book dialogue, Harley-Davidsons, low-budget chases, and Thermopods. This entry was posted in Episodes and tagged black lectroids, blue lightning, bubba, buckaroo banzai, burt, hong kong cavaliers, john gomez, john o'connor, motorcycle, new jersey, oscillation overthruster, outer space, penny priddy, perfect tommy, prof hikita, rawhide, red glasses, red lectroids, reno, secretary of defense, thermopod, van, yoyodyne. Returning guests Audra Wolfmann and Desmond Miller help discuss Minutes 30-35, which includes backstory on Penny Priddy / Peggy Banzai, Team Banzai’s impromptu press conference, spaceships resembling Cheetos, and a pay phone call from the President. This entry was posted in Episodes and tagged black lectroids, buckaroo banzai, cheetos, hong kong cavaliers, john gomez, john o'connor, new jersey, oscillation overthruster, outer space, penny priddy, perfect tommy, police station, prof hikita, rawhide, red glasses, red lectroids, reno, science, secretary of defense. Brett and Josh discuss Minutes 25-30 with Aimee Pavy from the Twelve Chimes It’s Midnight podcast, covering the Tragedy of Dr. Lizardo, the horrible Dr. Cotton, a BB video game, a red boombox, and how everything is better with Jeff Goldblum in it. This entry was posted in Episodes and tagged asylum, buckaroo banzai, bus, dr lizardo, guard, hong kong cavaliers, john whorfin, new jersey, penny priddy, perfect tommy, pinky carruthers, police station, rawhide, reno, sidney zweibel. For minutes 20-25, Josh and Brett are joined by singer, songwriter, and actor Billy Vera, who played Blue Blaze Irregular Pinky Carruthers in the film. The minutes cover Artie’s Artery, Penny Priddy, Buckaroo’s deep lines, and a bit of Dr. Lizardo. This entry was posted in Episodes and tagged arties artery, asylum, buckaroo banzai, dr lizardo, guard, hong kong cavaliers, john whorfin, penny priddy, perfect tommy, pinky carruthers, rawhide, reno, rock and roll. Brett, Josh, and Pete the Retailer from the Star Wars Minute podcast discuss Minutes 15-20. Topics include Buckaroo Banzai merchandise, Dr. Lizardo’s comic book-like backstory, a young Mike Ehrmantraut, monkeyboys, and Artie the Promoter. This entry was posted in Episodes and tagged 8th dimension, artie, arties artery, asylum, backstory, buckaroo banzai, dr lizardo, guard, hong kong cavaliers, john whorfin, lectroids, monkeyboy, oscillation overthruster, perfect tommy, pinky carruthers, prof hikita, rawhide, reno. For Minutes 10-15, Brett and Josh are joined in the Texas desert flats by Reels and Wheels podcast hosts Sid Bridge and James Rodatus, dissecting the 1982 Ford F-350 Jet Car, its jaunt into the 8th Dimension, and a bit of Dr. Emilio Lizardo. This entry was posted in Episodes and tagged 8th dimension, buckaroo banzai, dr lizardo, jetcar, lectroids, oscillation overthruster, prof hikita. Sean Murphy (keeper of the Buckaroo Banzai FAQ on figmentfly.com) joins forces with Brett and Josh to discuss Minutes 5-10, which features red glasses, Eskimo neurosurgery, prep for an iconic jetcar’s run, and the contents of Buckaroo’s briefcase. This entry was posted in Episodes and tagged buckaroo banzai, david begelman, general catburd, hanoi xan, jetcar, michael boddicker, neil canton, neurosurgeon, oscillation overthruster, perfect tommy, prof hikita, rawhide, reno, senator cunningham, sidney zweibel. Brett Stillo and Josh Horowitz begin analyzing the Adventures of Buckaroo Banzai Across the 8th Dimension with minutes 1-5, featuring the lost “home movie” opening with Buckaroo’s backstory, his parents, a gravity catapult, and the evil Hanoi Xan. This entry was posted in Episodes and tagged backstory, buckaroo banzai, david begelman, dvd, general catburd, hanoi xan, home movie, jetcar, masado banzai, mgm, neurosurgeon, oscillation overthruster, perfect tommy, prof hikita, rawhide, reno, sandra banzai, sidney beckerman, sidney zweibel, wd richter. Brett Stillo and Josh Horowitz discuss the Adventures of Buckaroo Banzai Across the 8th Dimension 5 minutes at a time. 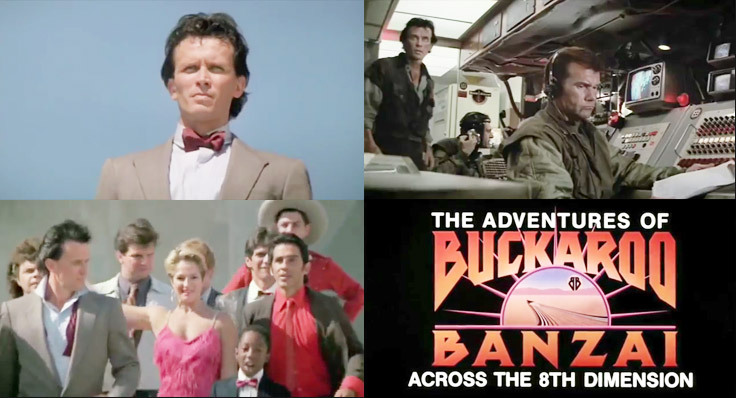 This preview episode covers the trailer to Buckaroo Banzai, which includes lots of bow tie. This entry was posted in Episodes and tagged banzai march, buckaroo banzai, ellen barkin, john lithgow, peter weller, podcast, preview, trailer, wd richter. 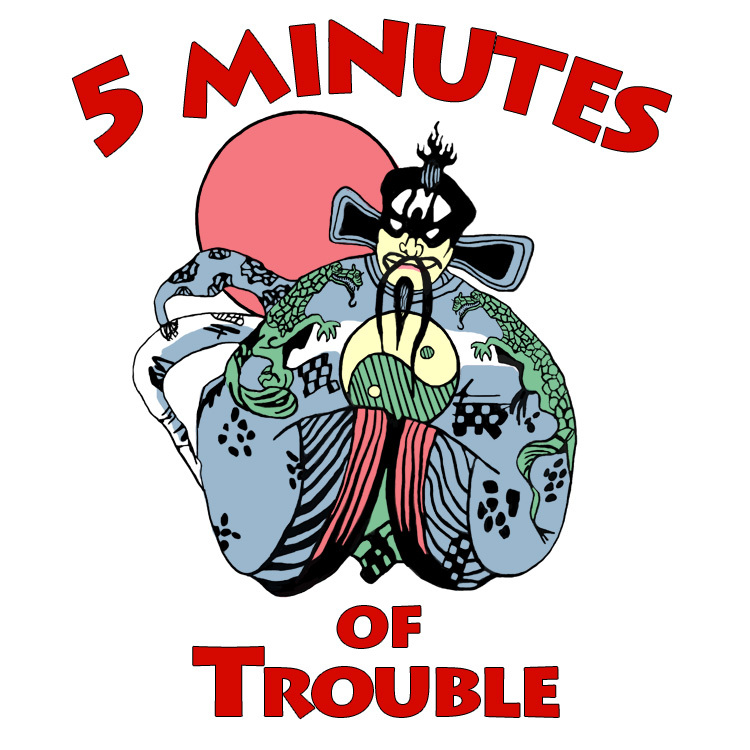 Be sure to check out our other podcast, 5 Minutes of Trouble. The inspiration for this podcast comes from Alex Robinson and Pete the Retailer’s epic podcast series “Star Wars Minute“, where they analyze, scrutinize, and celebrate the Star Wars movies (yes, even the prequels) one minute at a time. Be sure to check out their awesome podcast! Proudly powered by WordPress Theme: Eventbrite Venue by Voce Platforms.